Hi Nick, I followed your instruction and I am not getting the prompt to enter computer name. I will appriciate if you can let me know what I am doing wrong. Did you get the full code from the link “Full PromptForSystemName.vbs Code Here”? Also, did you place the code between Partition disk and Apply OS? Hi Nick, I am extremely sorry; I didn’t get a alert of you reply to my comment. Yes I did copy the code from this site and followed your instruction to every word. Still I had no luck getting the prompt on the screen. In the end I have created an Access database and VB script to generate PC name based on the PC model and rename without user intervenstion. Many thanks for your reply and again sorry for not replying sooner. This helped us out a ton!!! Thanks very much for posting this solution! What is in your Task Sequence Script Package? I use the “Run Command Line” task. If you click on the picture in the post, it’ll be easier to see. Why is Task Sequnce Script package is required? You don’t have to use a package, it’s just what I used for this example. You could cetainly just use the Run Command Line to execute the script from a server location. Or heck, you could even embed the script inside your boot.wim and then have it execute from there! There’s many ways to approach this…. I’m getting “Error: Invalid Character” when running this script. It’s probably a copy/paste issue, maybe caused by an invalid quotation mark. Start there. If you still can’t get it to work, I’ll try to email you a text file of the code. Back on XP this scripts worked but now we are on Win7, it even doesn’t comes up. Is it compatible with Win7? Thanks for the hard work and the tutorial Nick, helped me with my corporate image no end. Why the hell don’t MS have a task for naming the PC prior to joining the domain? SCCM makes manty things harder than they need to be. Still, problem solved thanks to you. Takes 5 seconds to set up. This worked perfectly for us. Thanks! Thanks for your script; I’ve used it while testing SCCM2012 and it’s saved me lots of time. I made a slight modification to your script, since I have one requirement for my environment – I have to make sure that all computer names are the same length and case format. Basically, I need to make sure that all my computer names are no longer than 5 characters and have to meet a criteria, so I I’m checking the user’s input against a regular expression, and if all goes as expected, the application continues. If you’re interested, I can send you the modified script. That’s great. I’ll check it and see if it can help me in any way. 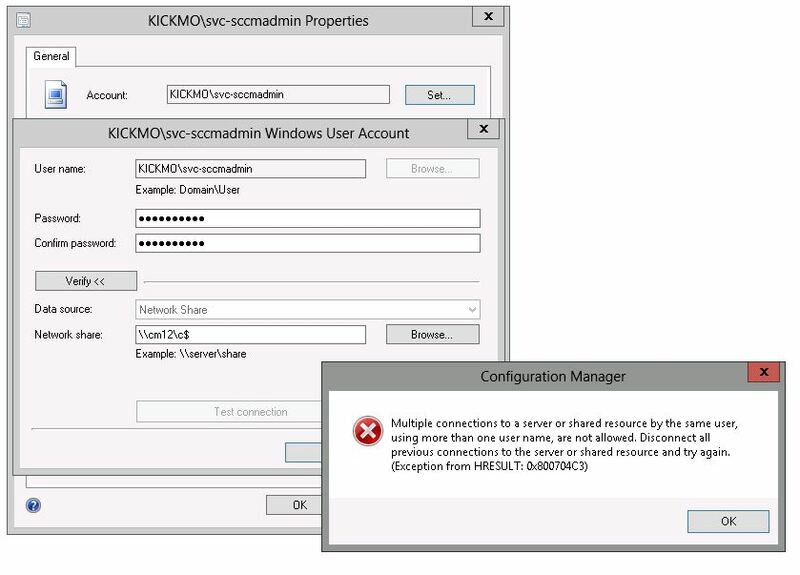 I’ve been testing SCCM 2012 in a lab environment, so this is my first exposure to SCCM. Based on your script, I have another slight modification planned. I’m going to allow the user to type a ‘Description’, since all our computer objects in AD have a description – which is mainly the user’s name. Good call on adding a field for the description! Hi Nick, I followed your instruction and I am getting PromptForSystemName task sequence error after the disk partition step. Tony, what is the task sequence error code? Did you place the script in a package? The TS error code i get is (0x00000001) during run command line action. I did not place the script in a package as you said don’t have to use a package, it’s just used for example. What i did is just put the ( cscript.exe “%deployroot%\scripts\PromptForSystemName.vbs” ) inside the command line box. The script works pretty good, but i wanted more for my environment. I modified it to support naming a computer based on a model abbrevation with a serial number and detect if it s VDI machine (Vmware serial is a bit long). If you’d like the modifed version, just ask. Yep, you bring up good a good point about the imported computer. 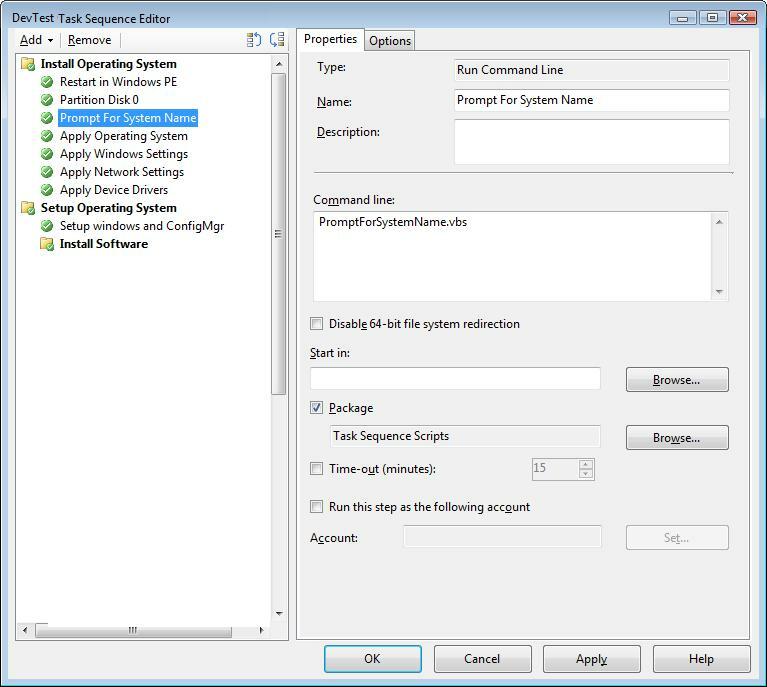 Personally, importing computer records into SCCM is an administrative PITA. Unknown computer support with R2 or later is the way to go, which is what this script is intended for. Yes it is basic but sufficient for many cases. Thanks for your effort. Glad to help :-) Thanks again for the feedback…. btw, can I apply this script for OSD USB deployment media? Should be able to do use it for USB, but let me know if it doesn’t work…. i used your code for a blog entry and also put a link to your blog into it. If you dont like it, tell me then i will delete the code and only left the link in the entry. No worries – I’m glad that it takes care of what you need! Well it would appear that this script is exactly what I am looking for, but I am not having any luck with getting this configured correctly for some reason. I am trying this on SCCM 2012 RTM and I have created a package that is solely the script and ensured it has been deployed to both my test collection and the Unknown Computers collection. I have configured the Task Sequence as you show above but when I attempt to run this I receive an error code of 0x80070002. I am fairly certain this has to do with regards to how I am creating the package, any suggestions on how to correctly create this package? I am quite lost on what I am not doing correctly as I’ve created packages/programs before without issues. The Network Access Account has been set, and is actually used/working for all client deployments, software deployments, etc. without any issues at all. I tried to pull the SMSTS log but it was actually stating it didn’t exists which I found to be really odd as I’ve pulled it many other times in the past. One other time I was told “access denied” to the log, which was also strange. As soon as I removed the PromptForSystemName.vbs portion of the task sequence everything worked correctly again. Any other suggestions? Thank you for your help! You are certainly right, that is very strange. It works for me just fine in my CM12 lab. If you want to confirm that the script itself is working, then open a command prompt in the task sequence, map a drive letter to the server share, then run the script. The trick to running the script is that the task sequence needs to be actively running, otherwise it cannot create the VBScript object for the task sequence environment. An alternative to this prompting script is that you could create the task sequence variable on the collection itself, which can then be edited to set the value. I did try the Task Sequence Variable option on the collection itself, and was able to get the prompt to input the name. Unfortunately it would never actually assign the value given as a computer name. Though it would assign the CM12 splash screen as the wallpaper, which was also interesting. Again, once I removed that part of the Task Sequence, all was back to normal. Grr… Sometimes I really hate CM…. I create a standard package and add it to the local DP of course. I use the Run Command Line option. See the image on the post to see what I mean. Again, remember that that error code should indicate that it cannot locate the file. That should really be the issue that is occuring…. Well, I am not sure what it was but I got it working! I redid the package entirely, ensured the share permissions were correct, redistributed everything to my DP’s, and redid the entire task sequence. I just ran an bare metal image and was prompted for the name, verified after imaging the name is showing correctly on the machine as well as is populated in the CM12 console! Thank you for the script and the advice on everything, I TRULY appreciate it!! Thanks again, I’ll be sure to frequent your blog, you have some great information! Awesome, thanks for the compliment. If you like as well, at the top left corner of the blog you can sign up your email and it’ll be delivered to you automagically. There are indeed a variety of ways to set the computer name. Thanks for contributing! No problem, I’ve spent so much time looking for different/best ways of doing it that when I finally found a simple way that (finally..) seemed to work with Dell Asset Tags, I thought it best to document it for others. I run it just like you have it here, but it still gives me a 0x00000001 error and then crashes out….Any other ideas? Hello Nick, I just came across your script. Do you have any scripts that will do the above except insert the serial number if the computer name meets the query of minint instead of prompting for user input? I am trying to piece something together now but I am no programmer. So the script would need to query wmi for the serial number and insert into osdcomputername variable if the computer does not already have a name. Make sense? Ray, there are plenty of other examples on the web for this, so you wouldn’t need to use my script necessarily. Nick, thank you for taking the time to answer my post. I actually saw that script, however it requires a manual input for the name. What I would like to be able to do is query the name like your script does and if it finds those names then use the serial number instead without a techs input. Your script is the closest I have been able to find that does just that. Creating a package is entry level operations for ConfigMgr. If you’re unfamiliar with this process, my advise is that you first take a course or receive formal training. As with any systems management tool, ConfigMgr is powerful system with the power to cause a lot of damage if not used incorrectly. Any idea how to use your script as well as the unattend.xml as this has other settings like IE home page, language and so on. Muthu, you will need to remove the reference within your unattend.xml file. Nick that link is a lot more than I need but I modified the code to this…. Is this correct? I know the ; makes it a comment…..
At a glance, that looks correct. ;’ Note: The wscript.echo commands are logged in SMSTS.log for troubleshooting. They are not displayed to the end user.